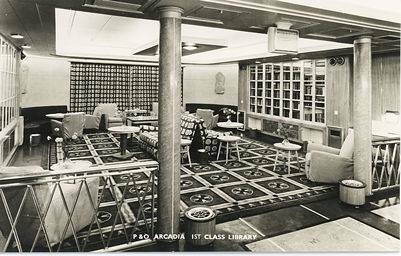 The Arcadia of 1954 was named after the 6,603 tons steamer of the same name which entered P&O service in 1888. Her name comes from the Greek 'Arkadia', a region of the Peloponnese, which as a place of simple pleasure and quiet, the ideal of rural felicity and pastoral simplicity. The Arcadia of Ancient Greece was often chosen as the background for pastoral poetry. The native of Arcadia was known to be the one who led a quiet and simple life. Builder: John Brown & Co., Glasgow, Scotland. Port of Registry: Initially London, later Southampton. 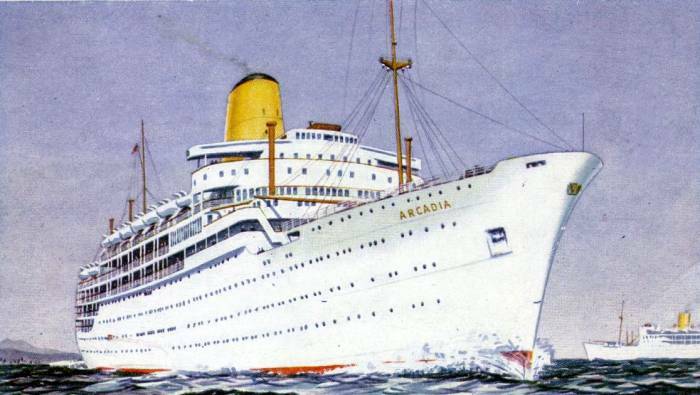 Arcadia was built by John Brown and Company of Clydebank at an estimated cost of £5 million, and launched on 14th May 1953 by Mrs D.F. Anderson, the wife of P&O’s Deputy Chairman. 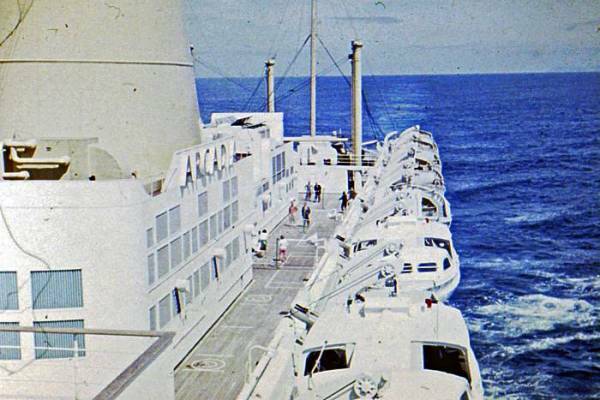 On the same day at Barrow-in-Furness, Orient Lines Orsova was launched also destined for the Australia service.Arcadia shared her birthplace with the Royal Yacht Britannia, launched a month earlier by Her Majesty The Queen. 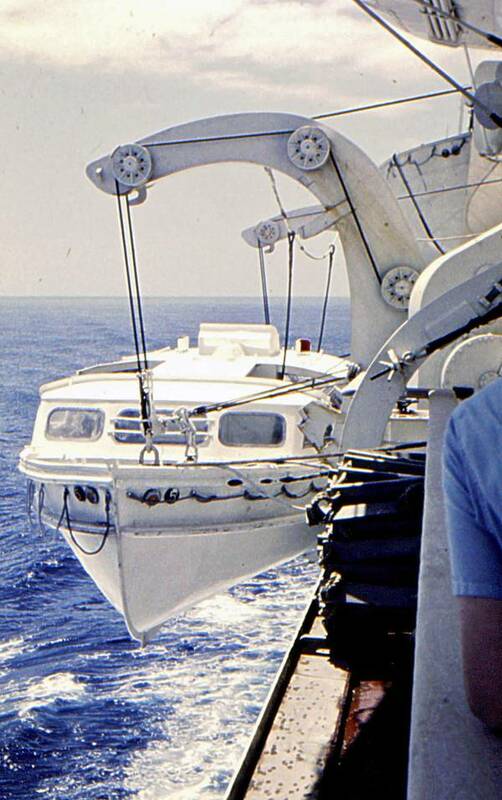 Developed with lessons learned from Himalaya, Arcadia had one notable difference: her funnel was larger in diameter, and had a domed top, which combined to give her a more stylish profile. 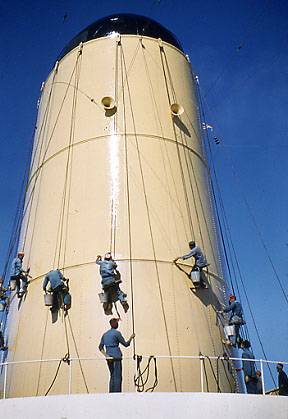 Indian seamen painting the funnel. 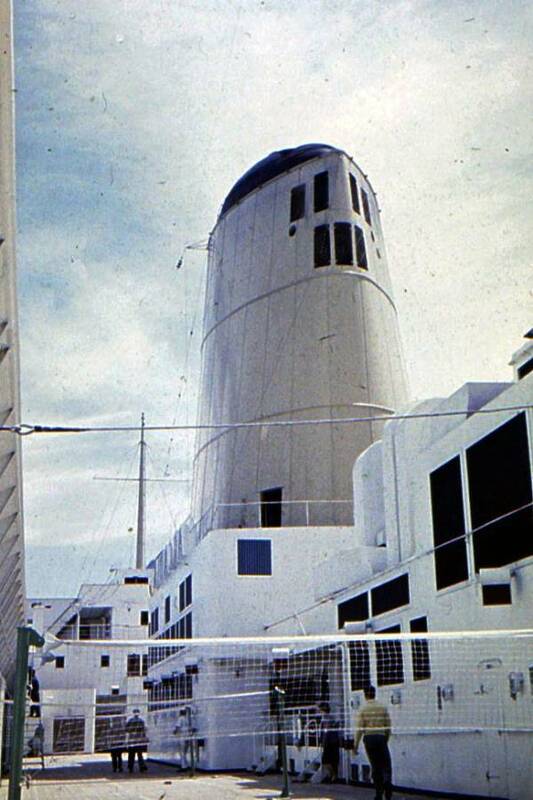 Her 'Clydebank’ funnel was designed by John Brown and Thermotank Ltd, in who’s wind tunnel the smoke tests were carried out to carry the fumes well aft of the ship and prevent them falling on open decks. Being something of a revolutionary design, it excited a good deal of comment at the time. 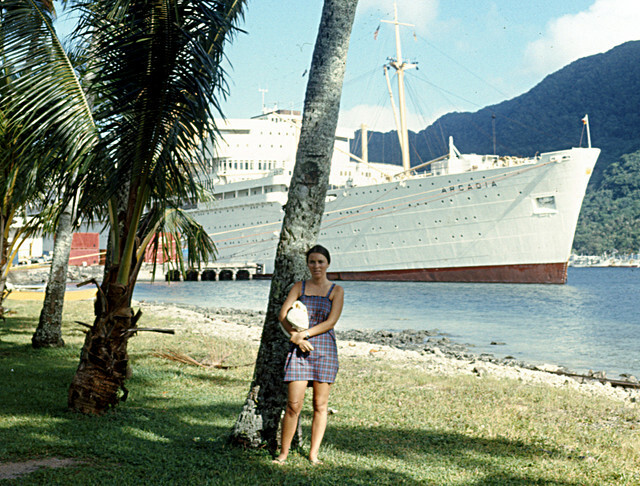 Her accommodation reflected the changes in sea travel since Himalaya's maiden voyage, some five years earlier, in that her tourist class was larger than her first class, with 735 passenger berths in tourist class and 675 in first. 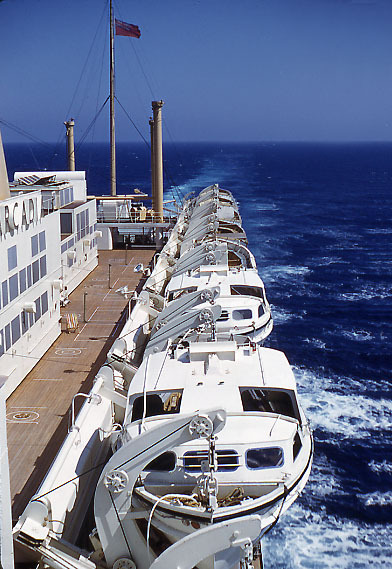 With the Arcadia, P&O introduced three berth cabins in first class and six berth cabins in tourist class. The latter proving popular with the younger Australia bound settlers and with holidav-makers bound for the United Kingdom. 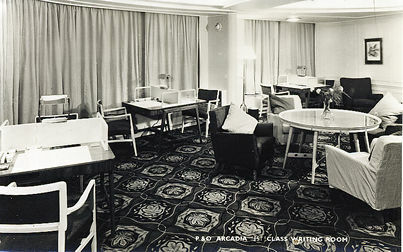 Arcadia's accommodation catered for first class passengers in one, two and three-berth cabins, including eight two berth deluxe cabins. 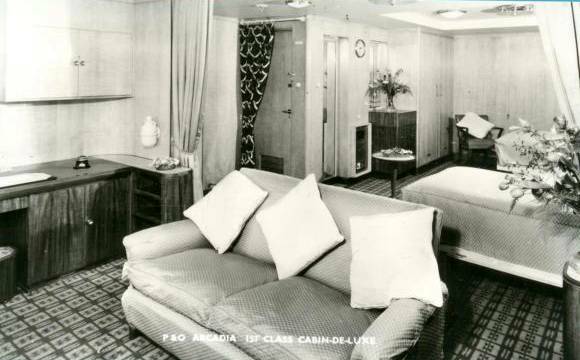 In the tourist class, passengers were accommodated in two, four and six berth cabins. 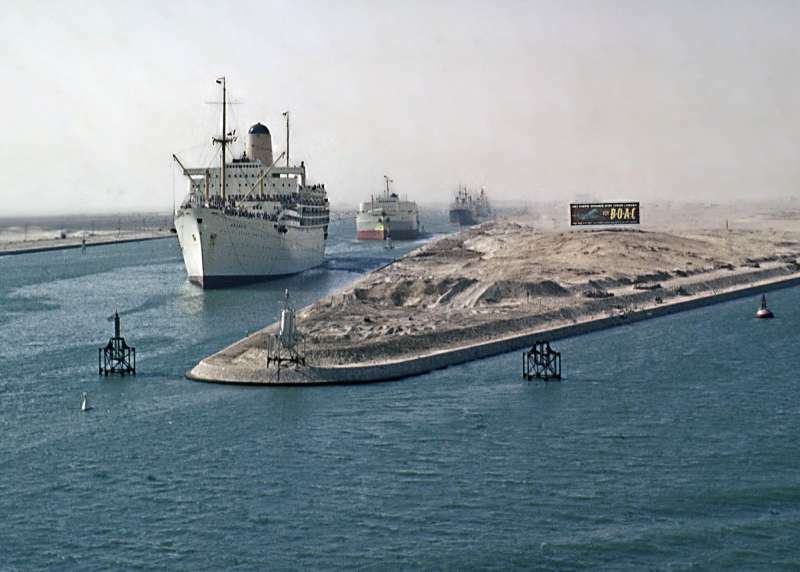 Arcadia’s gross tonnage was 29,871, 271ft long and 91ft breadth. Her single reduction turbines developing a maximum of 42,500 shaft horse power giving her a service speed of 22 knots. A fresh water distilling plant was able to produce 500 tons of water daily. The hold carried a measurement of 153.813 cubic feet of refrigerated cargo space. 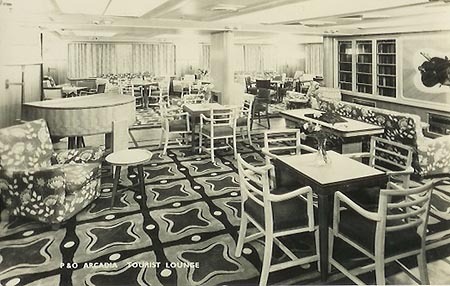 Great efforts were made with Arcadia to incorporate into her design all the latest ideas and improvements. New metals were also introduced in her building. 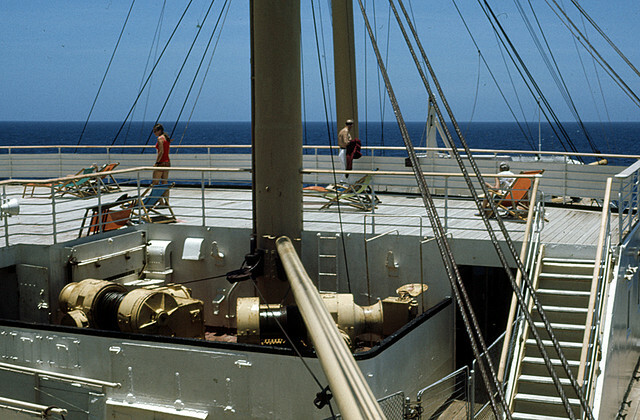 All the ship’s ladders were constructed from an alloy which proved as strong as the old metal ladders in previous ships. Arcadia being the first P&O ship to try this new alloy material. 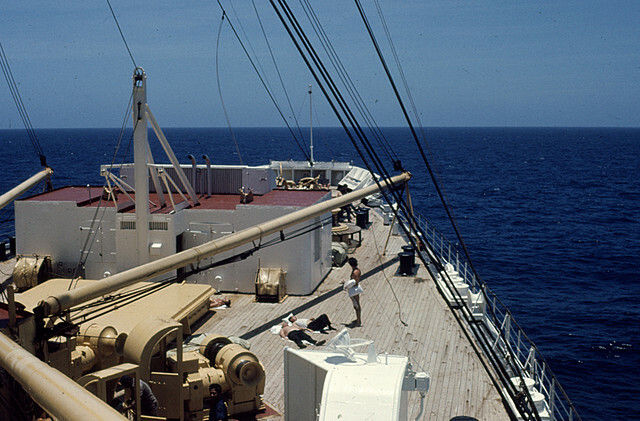 A waterline model of her hull was built for experiments on upper deck arrangements and how she would look at sea. 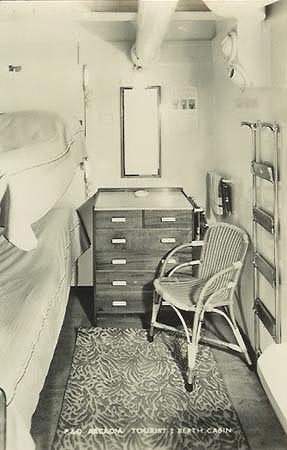 A set of cabins were built ashore, where various fittings, furniture and colour schemes were tried out, the same model ideas being used on a mock up bathroom and shower. 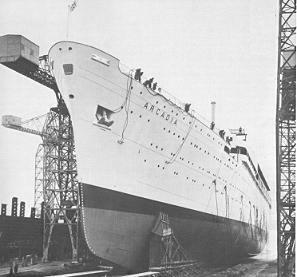 Arcadia was fitted out at a berth in John Brown’s Clydebank yard, alongside the Royal Yacht Britannia, where her internal work fell behind schedule, supposedly because of the direction of labour to the Royal Yacht as the priority job. 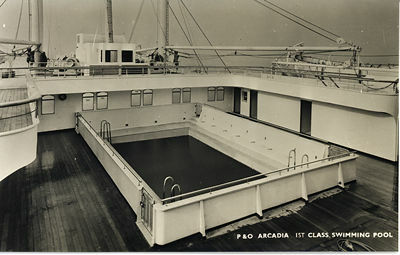 Arcadia sailed on her maiden voyage to Australia carrying some 50 workmen, carpenters and plumbers, to complete her internal arrangements. 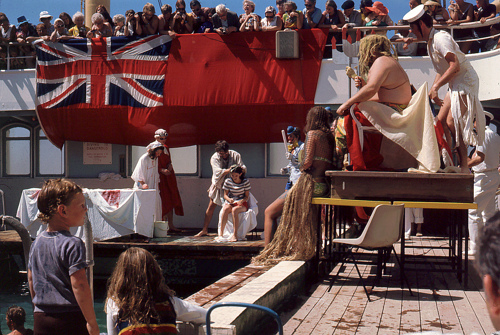 It was reported that they were paid for 24 hours work, 7 days a week, for the whole duration of the voyage. 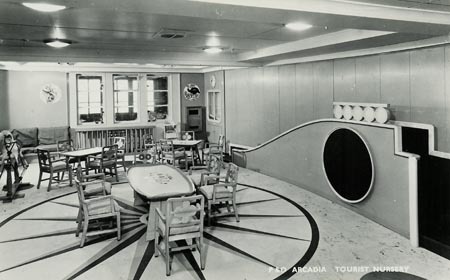 Arcadia's interior decor was the very model of British understatement. A Greek theme prompted by her name was incorporated throughout her interior. Nowhere was this more obvious than in the naming of her public rooms. 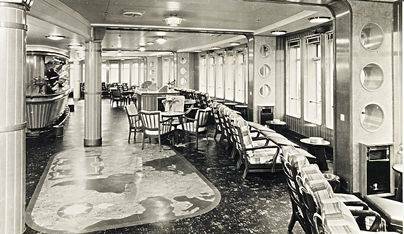 The first-class dining room was named 'Olympic' and the tourist class, 'Corinthian'. 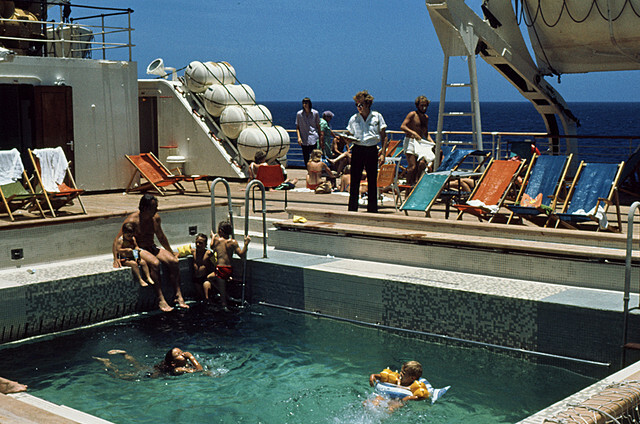 Other major public areas were named 'Apollo', 'Orpheus' and 'Odyssey'. On 20th January 1954, under the command of Commodore G C Forrest, who was her captain for the maiden voyage, and who remained in command until his retirement some two years later, she sailed to Liverpool where her Denny Brown stabilizers were fitted in Gladstone Dry Dock. 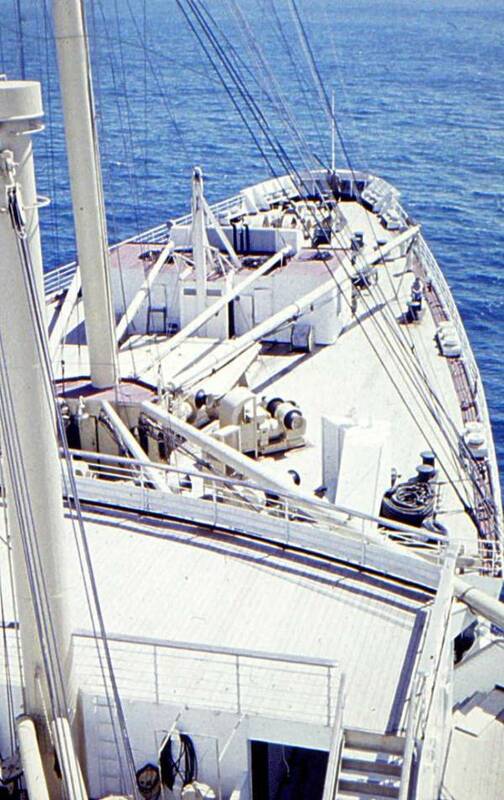 She was the second P&O ship to be fitted with fin stabilizers, Chusan being the first. From Liverpool, Arcadia returned once more to the Clyde where, off the famous Tail Of The Bank, she ran her acceptance trials. 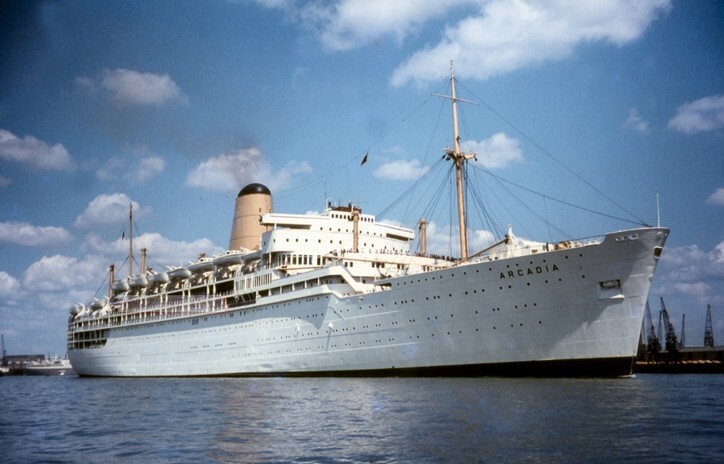 Arcadia sailed on her maiden voyage from the Tilbury Landing stage on 22nd February 1954, bound for Port Said, Aden, Bombay, Colombo, Fremantle, Melbourne and Sydney, arriving in Sydney on 27th March, and later returning to England by the same route. 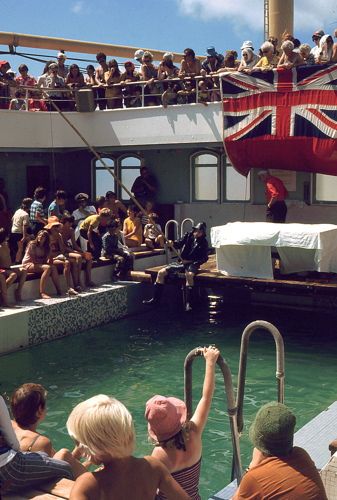 Immigrants to Australia filled the Tourist Section of the ship. 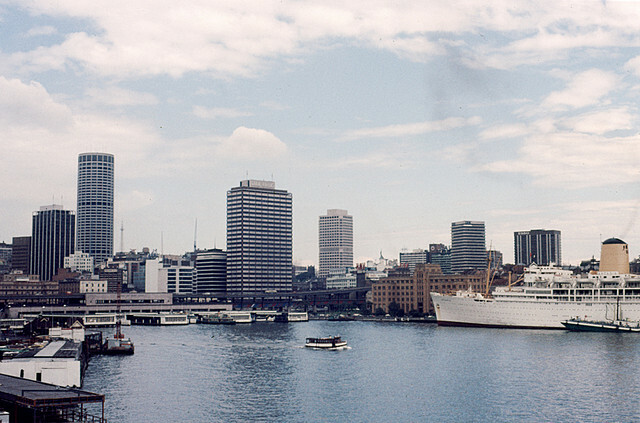 On 22nd November 1959, Arcadia departed Sydney on her first cruise from an Australian port. 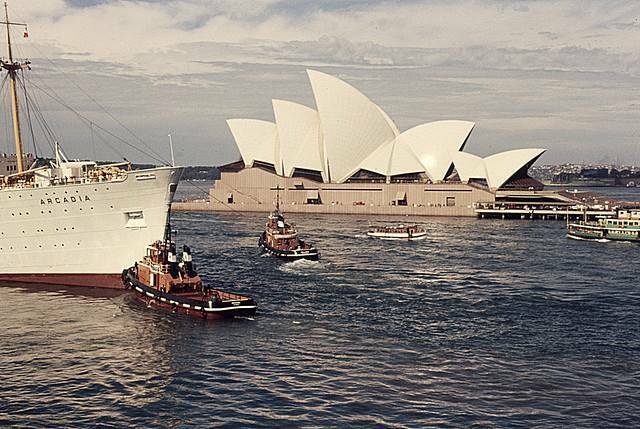 With P&O expanding their route network, she left Sydney on 11th December on her first voyage across the Pacific, calling at San Francisco and returning to Sydney on 19th January 1960. 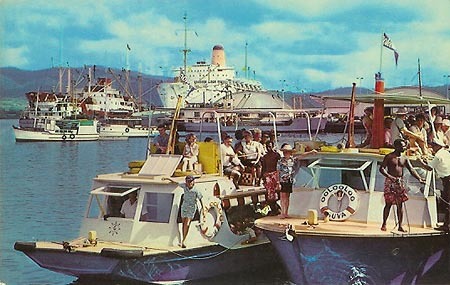 Throughout the 1960s, Arcadia combined main line voyages with cruises from Britain and Australia, and also trans-Pacific voyages, some of which transited the Panama Canal. 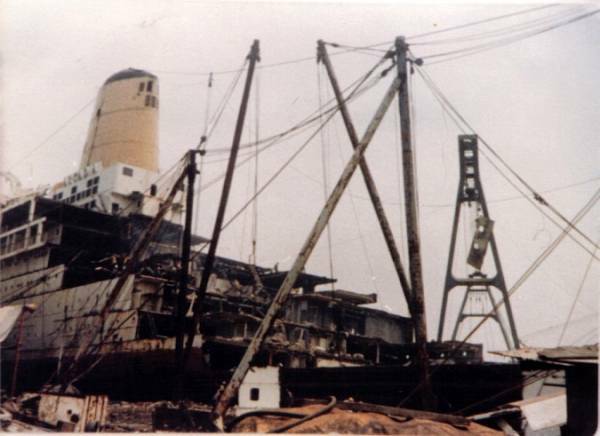 During a refit early in 1970, her mainmast was removed, and the accommodation converted to one class, with a capacity for 1,372 passengers. 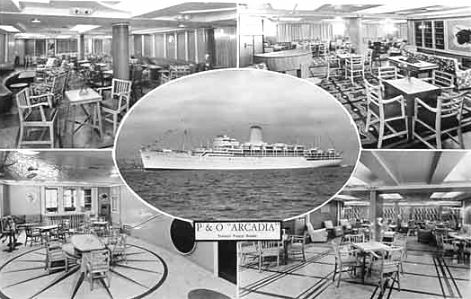 On 26th April Arcadia left Southampton for Sydney, then on to San Francisco. 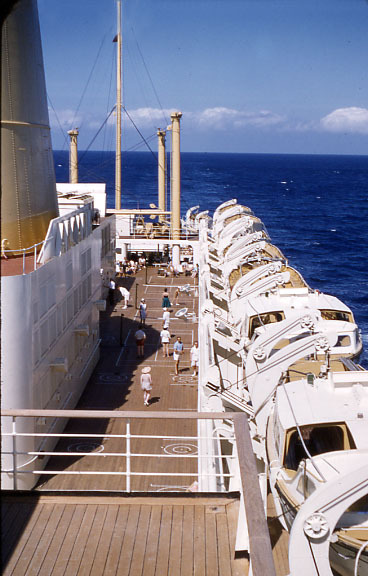 From there the liner made a series of cruises to Alaska until October, then cruised to Mexican ports. 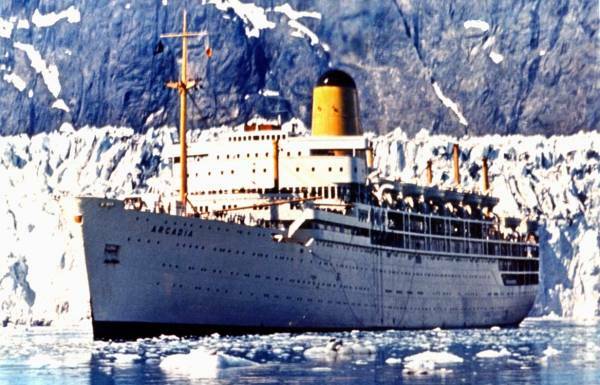 In October 1974, the company's Himalaya was withdrawn from the Australian cruise trade, and replaced by Arcadia. 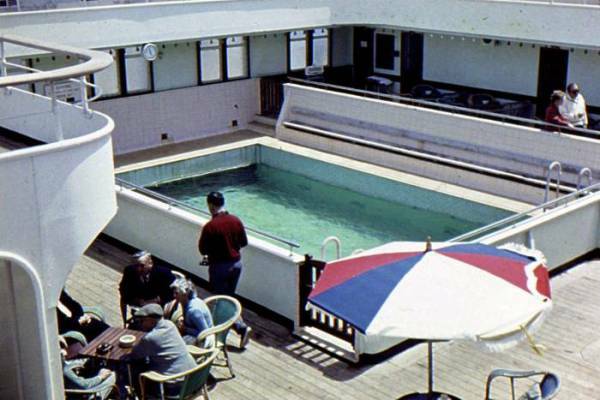 In 1975 and 1976, Arcadia made one return trip to Britain, with a final departure from Southampton on 8th May 1976. 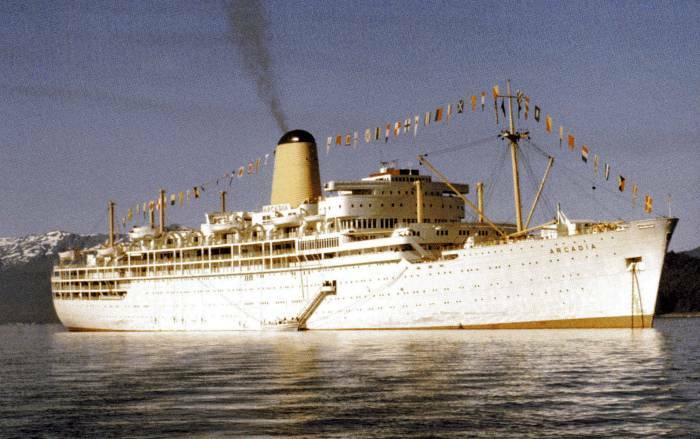 Subsequently Arcadia was based permanently in Sydney, cruising to the South Pacific and Asia, with her accommodation reduced to 1,240 at this time. 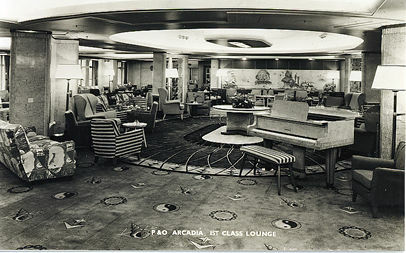 Arcadia had sixteen public rooms, nine of which were in the first class section. 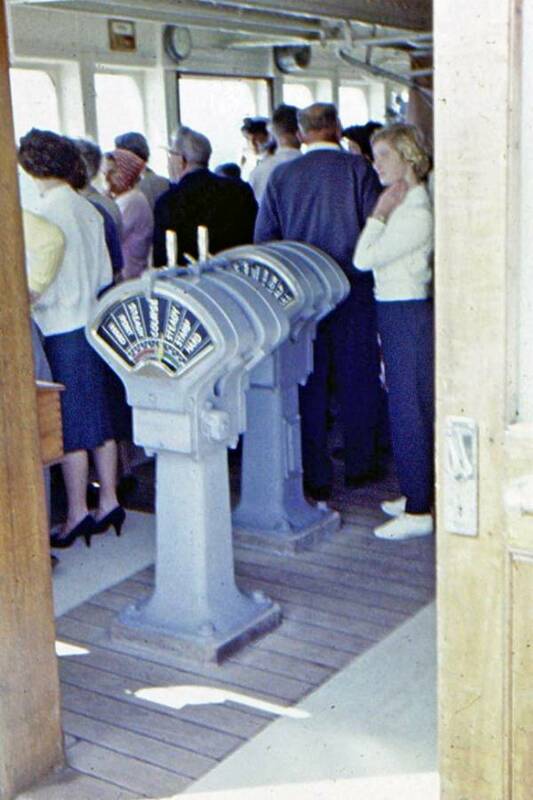 One of the most popular of these was the Lookout Bar situated on the boat deck, immediately below the bridge. 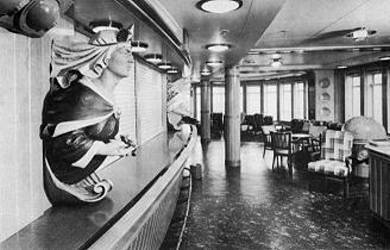 Ship's figureheads stood on either side of the bar, meticulously copied from those of old wooden sailing ships. 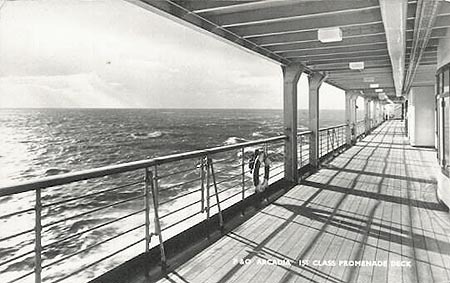 This elegant room was fitted with long windows on three sides which gave the passengers a panoramic view of the sea around them. The decor had a maritime character, while the floor featured two map panels showing the eastern and Western hemispheres. The centre piece was in the form of a chart table, complete with a compass and chronometer, flanked by terrestrial and celestial globes. 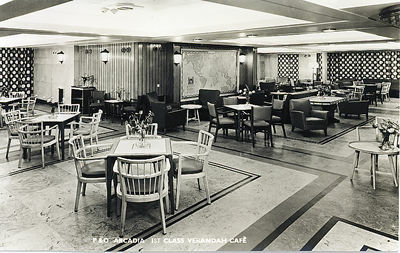 First Class Lounge and Library showing the ornate carpets supplied by Templeton's of Glasgow, who commissioned the photographs. 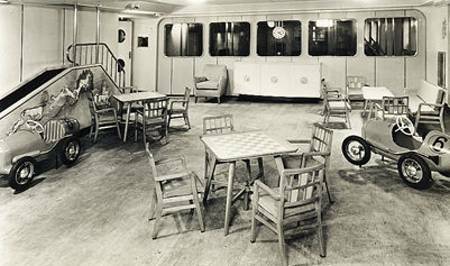 The lounge was a large, high room with windows on either side; the central section of the ceiling was circular in shape with a panelled perimeter arranged to carry concealed lighting. At the after end, between the glazed doors leading to the ballroom, was a wide, deep mural on an Arcadian theme, painted on a concave panel. 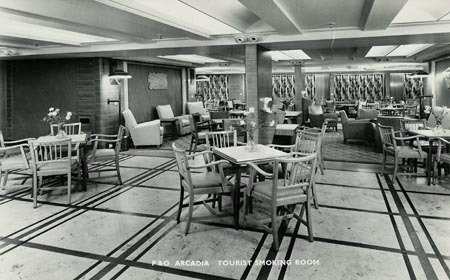 Postcard depicting Tourist Class public rooms. 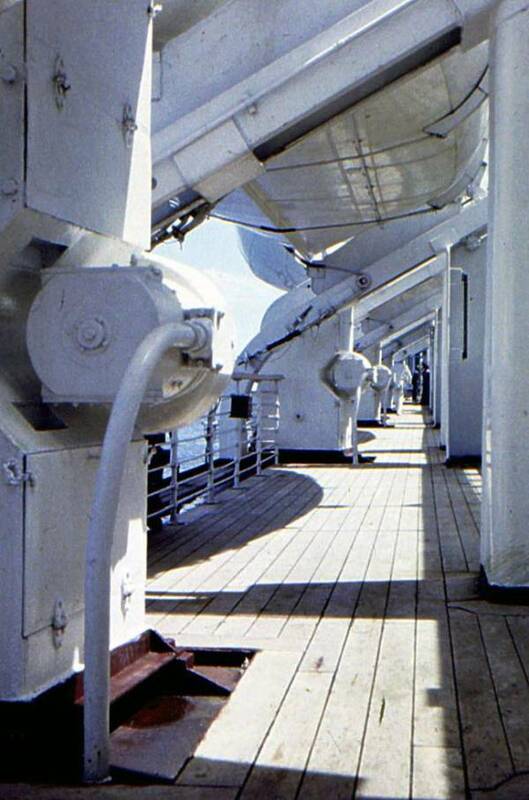 The foredeck, crew sunbathing area. 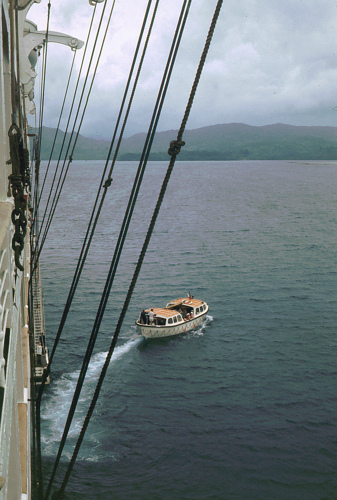 Ian Byard's 35mm Arcadia Photographs - New Zealand cruise, 1958. 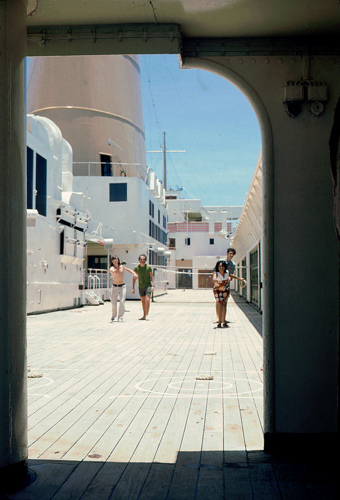 "The photo of a Bridge Visit shows P & O’s Owner's Agents- Macdonald, Hamilton & Co – shore staff from Melbourne, Sydney Brisbane and Auckland offices. 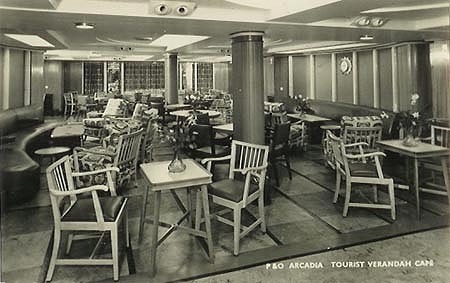 We were all able to travel for the princely sum of £A1.00 per day, victualling rate – First Class!, Second Class was A15 shillings a day!” We spent a lovely two weeks aboard Arcadia... I think she is still my favourite all these years later. She was a “happy” ship." 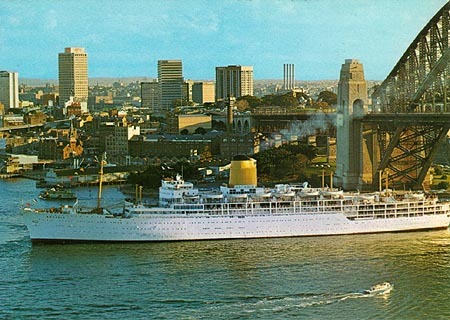 On 29th January1979, Arcadia left Sydney for the last time, and Brisbane two days later, before heading for Manila, and on to Hong Kong. 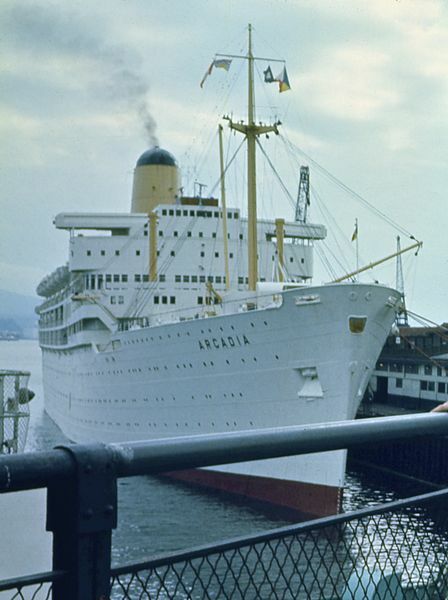 The cruise was to have terminated there, and the passengers transferred to P&O’s latest acquisition, Sea Princess, formerly the Swedish American Line’s MS Kungsholm, but that ship had been delayed so Arcadia continued on to Singapore, berthing there on 21st February. 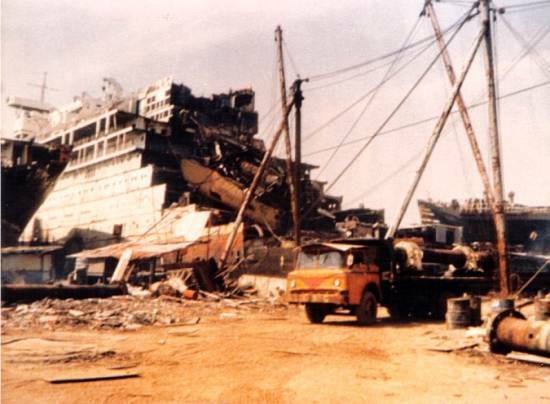 Once her passengers had transferred to Sea Princess, Arcadia proceeded to Taiwan, arriving in Kaohsiung on 28th February, where she was handed over to a firm of shipbreakers and broken up for her scrap metal.